This cable is for use with Darklight / Gantom mini LED fixtures and other brands. This is our custom-built DMX / Digital Gold TRS 1/8" (3.5 mm, Mini) to Gold TRS 1/8" (3.5 mm, Mini). Construction is Mogami Digital 3080 cable, all Neutrik connectors, TRS 1/8" to TRS 1/8", various lengths and options. Neutrik connectors are some of the best connectors around. 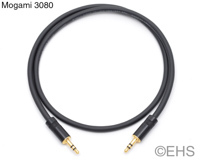 Mogami 3080 cable is very flexible, durable, light-weight cable.